Cut butter into flour, sugar, baking soda, baking powder and salt in large bowl, using pastry blender or crisscrossing 2 knives, until mixture resembles fine crumbs. Stir in raisins and just enough buttermilk so dough leaves side of bowl. Turn dough onto lightly floured surface. Knead 1 to 2 minutes or until smooth. Shape into round loaf, about 6 1/2 inches in diameter. Place on cookie sheet. Cut an X shape about 1/2 inch deep through loaf with floured knife. Did you know? 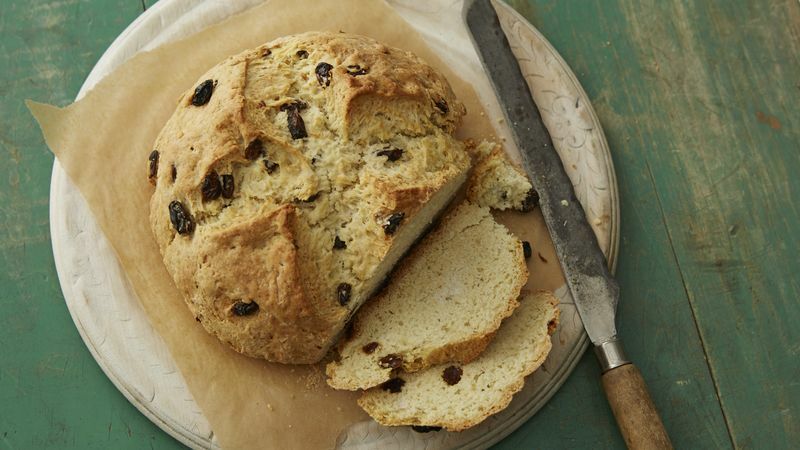 : Why the "X" on top of Irish soda bread? Legend tells us that this cross is meant to scare away evil spirits. Spooky!